Riding Tips & Questions Whether it's passing your knowledge down for future generations or if you've got a questions for the elders ;) this is the place to put it. I went through the motions online to see what tires qualify, and it appears that pretty much all of the current models do. 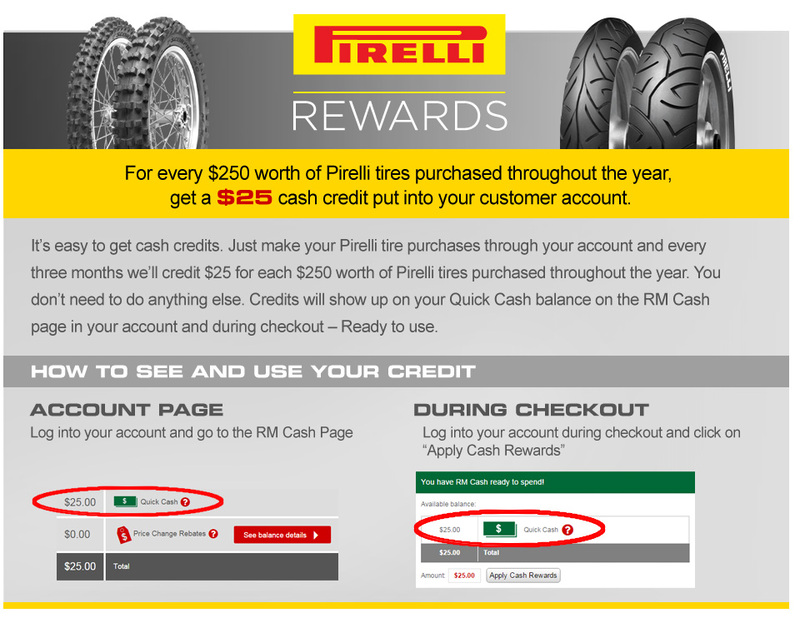 non-race, non-motocross motorcycle tires in any combination, you may be eligible to receive a $50 USD METZELER Visa® Prepaid Card by mail. 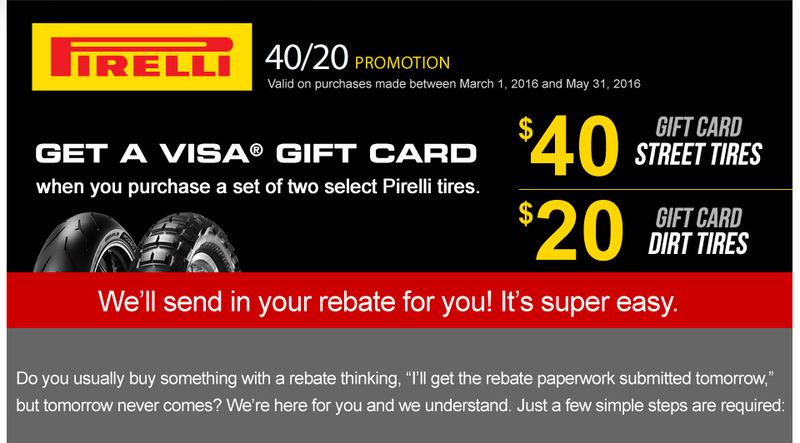 Offer valid on tires purchased from participating dealers between 12:00 a.m. ET February 1, 2016 and 11:59 p.m. ET April 30, 2016. Offer valid only for legal residents of the 50 United States and the District of Columbia who are individual consumers. Claims must be postmarked or submitted by May 30, 2016. Still plenty of tire rebates going on but I just saw Avon Ultra 3D 80 ( $75 rear) and 3D ultra 79 ($65 front) Motorcycle SuperStore so that's $141 for a set of stickies to your front door! I put those Avon 3D's on my FZ6 in February and had paid $189 for the set on Black Friday. Pretty nice tires, and at $141 one hell of a deal. I just bought a front PR4 that cost $147 alone. If they put the Storm 3D X/M down at that price I'd be all over that even if I just loaded up a set of PR4GT's on my bike. I'm not sure I'd like the 3D sport I doubt they would get the miles the Storms do. Yeah, mine are the 3D Ultra Sport... for the FZ6 they made sense. However, I did buy 2 rears and 1 front, thinking like most tires you end up with that being the wear ratio anyhow. Sold the bike and the seller didn't want the extra rear. So now that I only have the Tiger that uses the 180 rear, seems like I'll be testing out the 3D on the 525# beast come mid July. I've heard nothing but GREAT things out of the Bridgestone T30 and new T30 Evo. They're cheaper than PR3's or 4's so I think that'll be the next sport touring set I mount up. I've heard nothing but GREAT things out of the Bridgestone T30 and new T30 Evo. I'm about 5000 miles into a set of T30's (not Evo) on my Blackbird and I can confirm they are great tires. Looks like the front will easily be good for 10k and the back should get pretty close. Good wet grip, good dry grip. Just finished a 1500 mile run through TN, NC, SC, GA, AL, and MS on some hot and abrasive southern roads and they did fine. Fast-50 deal going on again (still?) through the end of August. Nice! I was about to order another set of T30's from Chaparral this month anyway. Thanks man!